It’s the thinnest laptop with a touch display. HP’s Spectre 13 has always wanted to steal users from the MacBook Air, and it may finally have its killer competitive feature: a touchscreen. The Spectre 13 refresh that debuts Wednesday morning is the world’s thinnest laptop with this feature—and it’s something the MacBook Air simply doesn’t have. HP also crammed a surprising amount of hardware into this sliver of a PC, with fewer compromises than you’d expect. Due credit should go to the latest 8th-generation Intel Core CPUs, whose greater efficiency and performance are making this season’s laptops some of the most promising we’ve seen in years. 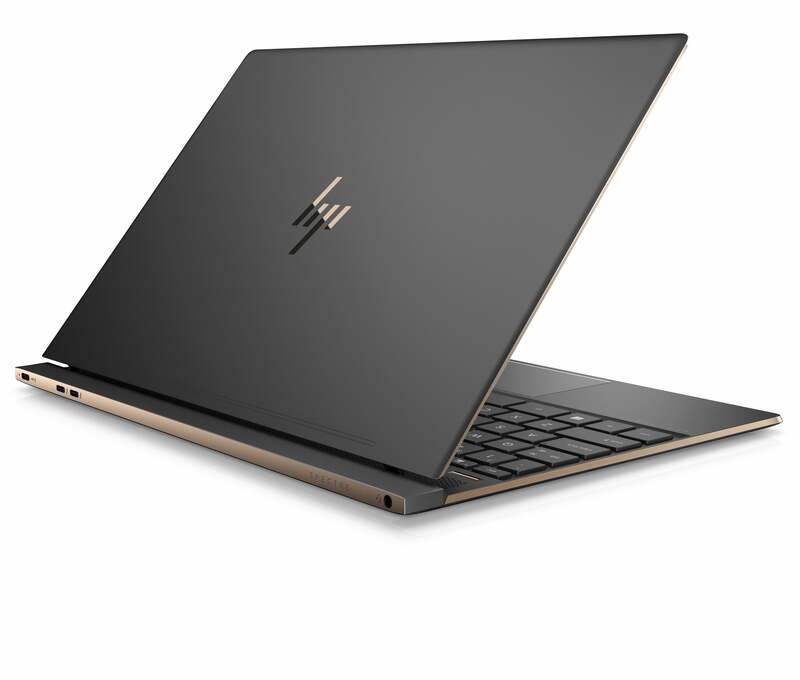 The HP Spectre 13 retains the Dark Ash Silver color with copper accents from past generations. The Spectre 13 will ship on October 29 with a starting price of $1,300, including a color-matched pen. Best Buy will begin taking pre-orders October 4. CPU: Intel 8th-generation Core i7-8550U, a quad-core CPU with a 1.8GHz base clock and turbo boost up to 4GHz. Core i5 CPUs will also be available. RAM: 8GB LPDDR3 SDRAM, with options up to 16GB. Storage: 256GB PCIe NVMe M.2 SSD, with options up to 1TB PCIe. Display: 13.3-inch backlit FHD (1920x1080) IPS touch display with Corning Gorilla Glass NBT. There’s also a pricier 4K (3840x2160) option. The HP Spectre 13 also comes in Natural Silver. Audio: Bang & Olufsen dual speakers, which HP says are louder and better-sounding this year, with discrete amplifiers. 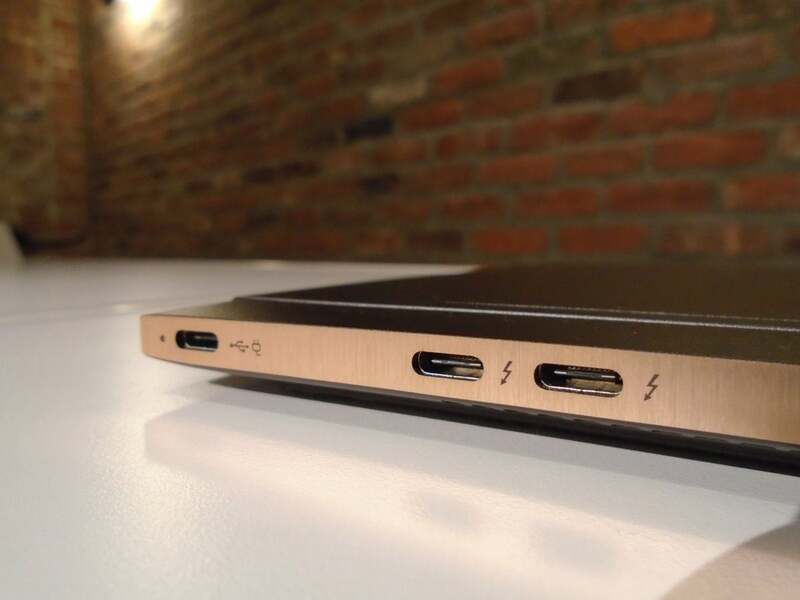 HP's Spectre 13 locates its ports along the hinge area, because the sides are too thin. All the ports are in the rear hinge area, because the sides are too thin to accommodate them. The front-facing webcam is HP’s TrueVision HD IR model with integrated dual mics, supporting Windows Hello facial recognition. Colors: Model af012dx comes in the new Ceramic White with Pale Gold accents. The other colors are Dark Ash Silver with copper accents, and Natural Silver. 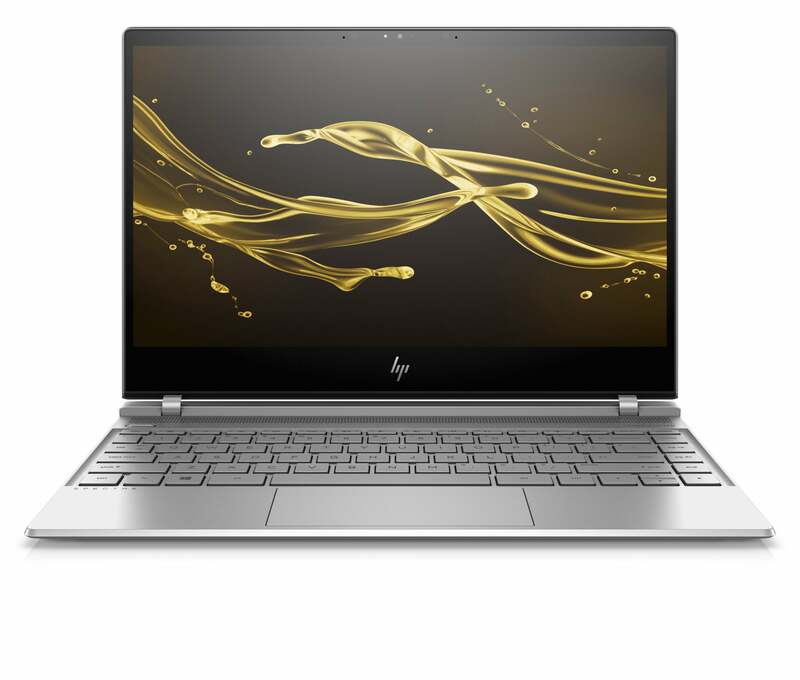 Ceramic White with Pale Gold accents is a new color scheme for HP's Spectre 13. HP claims up to 11.5 hours from the FHD-equipped af012dx, depending on use case. Expect about 9 hours from the Spectre 13 when equipped with the 4K display option. HP’s Fast Charge feature lets you recharge the battery from zero to 50% within 30 minutes if you charge when the laptop is shut off. HP changed the texture of the Spectre 13's hinge area so it wouldn't attract fingerprints. The new, matte surface is shown above the older, smooth surface that showed prints. 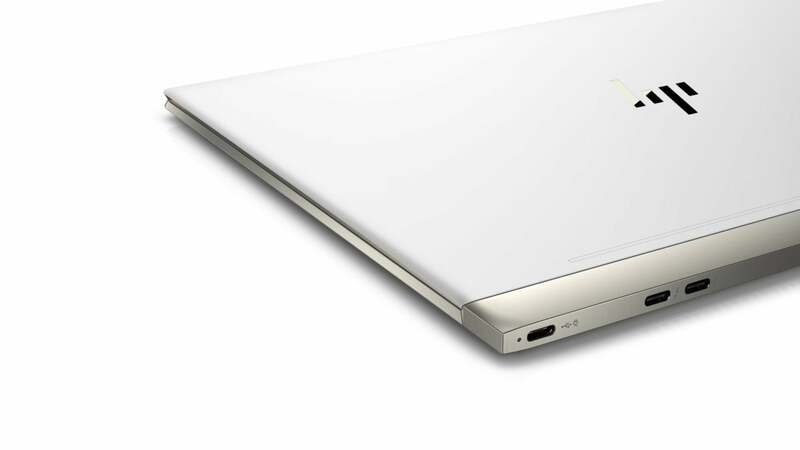 The latest Spectre 13 makes a fashion statement, debuting a new color: Ceramic White with Pale Gold accents. The scratch-resistant paint has a soft, matte look and feel and is (HP claims) easy to clean. 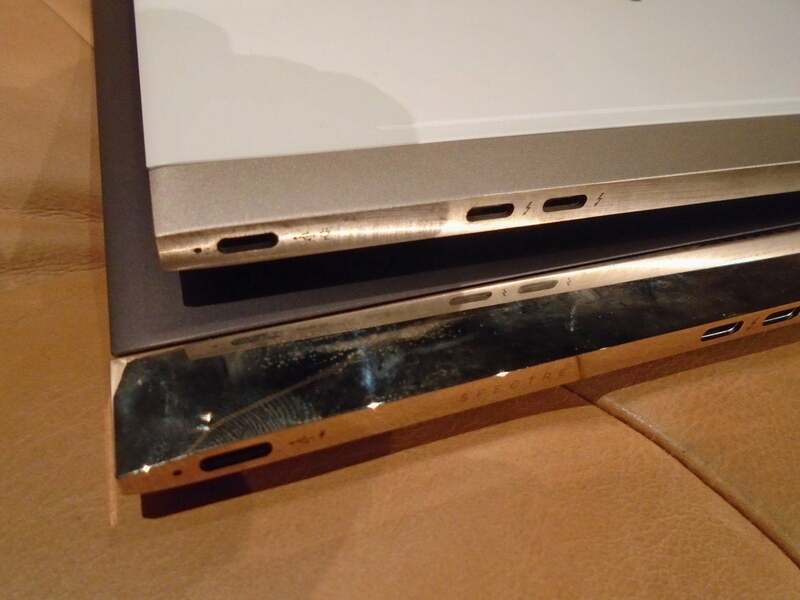 The HP Spectre 13's hinge is neatly concealed underneath the display lid when the laptop is closed. The coaxial hinges gleam when the laptop is open and disappear into the laptop’s body when closed. The polished surface of the prior generation’s hinge area attracted too many fingerprints, so HP has replaced it with a brushed texture that don’t show any schmutz. HP tweaked the keyboard design, too. Some changes are cosmetic, like the subtle carving around the keyboard area. The keys offer 1.3mm of travel, which is about the least you’d want—they felt okay during a few anecdotal minutes of use at the briefing. HP also built an extra full-width rubber foot into the bottom of the Spectre 13 to minimize annoying bounce during use. 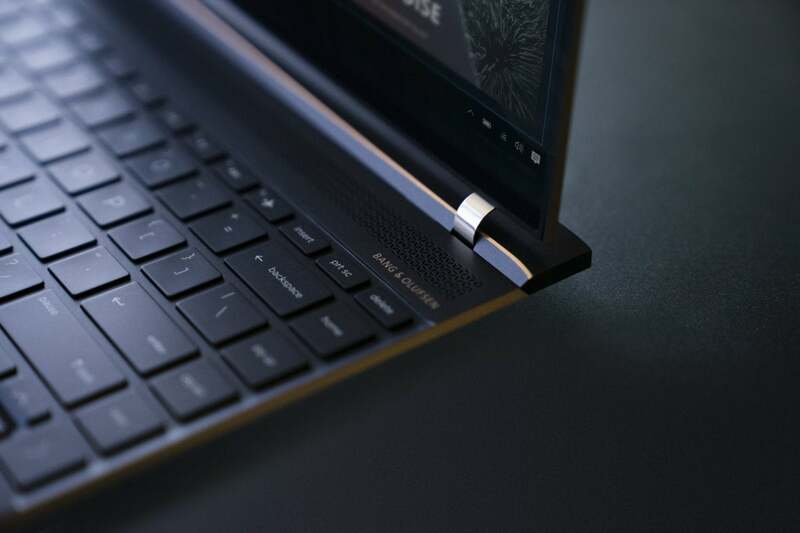 The HP Spectre 13's keys have 1.3mm travel and extra reinforcement underneath to minimize keyboard bounce. Thin laptops have always meant compromise before, but something is changing with the new Intel CPUs and other technological advances. 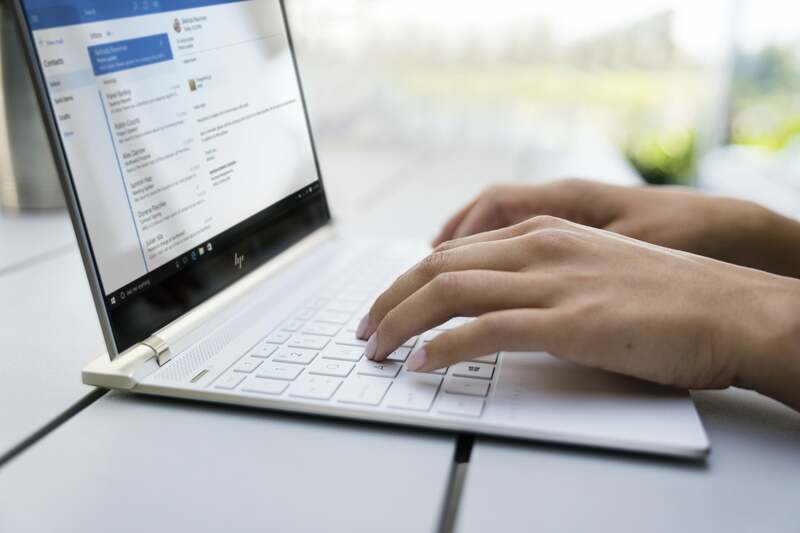 HP claims the new Spectre 13 is 50 percent faster than its predecessor when running the Sysmark benchmark, and 40 percent faster in the Handbrake test. We’ve heard similar claims from the latest Dell XPS 13 model. Even coming close to those claims would be a big improvement for this class of PC. We’ll let you know what we find out if we test the HP Spectre 13.